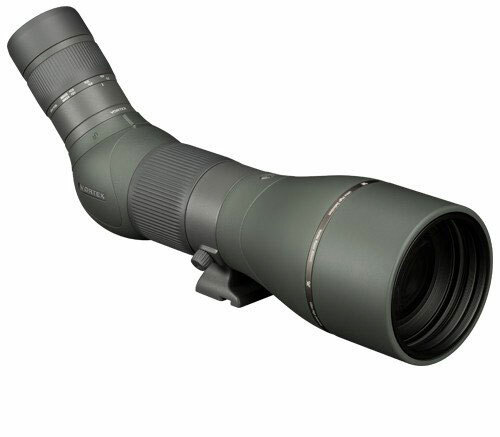 In the world of full size birding scopes, there are some new kids on the block. The popular 85mm Vortex Razor HD scope has a design upgrade. It's the new Vortex Razor HD 27-60x85. Also, Zeiss has shipped their Zeiss Conquest Gavia 30-60x85. 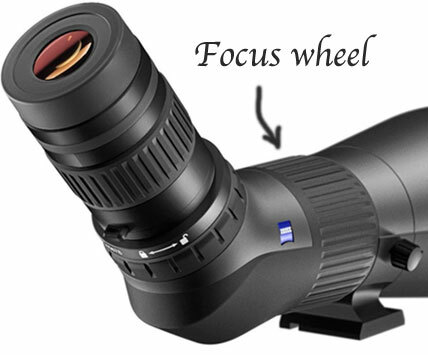 With both these new scopes, focusing is now accomplished using a wide, knurled band that circles around the scope body. 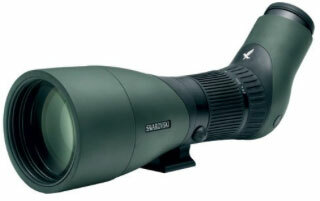 This is the same focusing design as the top end Swarovski ATX 25-60x85. But the Swarovski will set you back $4088. The good news is that the Vortex Razor has not increased in price — it's still $1600. And the Zeiss Conquest Gavia is about $2000, less than half the price of the Swaro. It looks like the high-end Swarovski. It may take some getting used to. In the past, most scopes (like the previous Vortex Razor, at right) were focused by small double knobs at the top of the scope. The larger knob moved quickly through the focus range, and the smaller knob moved slowly and allowed for fine adjustment of the focus without disturbing the image. Some folks may find at first it's harder to fine focus with the band around the body of the scope, but with a little practice, it gets easier. And in your excitement to see that special bird you will never try to use the wrong knob! Testing: We tried out the three scopes under identical, controlled conditions. We used a T-21-RP USAF 1951 resolution chart from Applied Image Inc.
We also like to study the fine engraving on a dollar bill, where we find small print and intricate detail. A person's eyes do not perform exactly the same all the time, so we repeated our tests the scopes many times to ensure that we saw each scope's best performance. The Zeiss Conquest Gavia and the Vortex Razor both have very good resolution. The resolving abilities of the two were so close that in our tests we could not rate one higher than the other. Because the Gavia and the Razor seemed so similar in their resolution, we thought it would be interesting to find out if we could see any difference with a high-end scope. We tested the Swarovski ATX 25-60x85 and found that we could distinguish details in an object that was about 2/3 the size of what we could see with the other two scopes. So yes, clearly the Swarovski outperforms the less expensive scopes on resolution, as we would expect. You get what you pay for. Both scopes provided a nice, bright image. The black elements of the chart looked black and sharp against the white background. We perceived that the Vortex held a very slight edge over the Zeiss in brightness and contrast. When you look at the edge between black and white areas in an optical image, you sometimes see a fringe of green or pink. This effect occurs because the component colors of light spread out and separate when they pass through glass. It is called chromatic aberration. You don't necessarily see, in all of the image, how the light has spread, but if it's happening anywhere, it's happening everywhere. That slightly blurs or muddies the image. High quality optical instruments use special glass and proprietary coatings on the lenses that minimize the amount of chromatic aberration in the image. Lower quality optics show very obvious chromatic aberration. The Zeiss Conquest Gavia and the Vortex Razor HD both are remarkably free from chromatic aberration. We found the barest minimum of chromatic aberration, and only if we specifically looked for it. We did not detect any significant difference between the two scopes in this regard. What is field of view? Quite apart from the magnification, the field of view is a measure of how much the image fills your field of view. You could think of it as how many boxcars you can see of a train crossing your path the same distance away. Substitute feet for boxcars, make the distance 1000 yards and you understand the FOV specification. For example, 117 feet at 1000 yards. 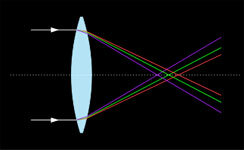 Field of view depends on the design of the eyepiece. 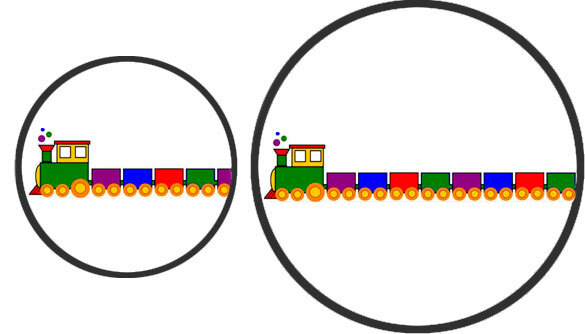 Two scopes may have a very different field of view at the same magnification. Field of view is very important in a scope. A wide field of view makes it much easier to find the bird. Wider field of view also has an advantage of providing a more immersive experience, more like you are watching up close, rather than looking through a tube. Field of view also depends on the magnification. As you zoom in on a subject with a particular scope, the image grows bigger, and the field of view grows narrower. So in evaluating scopes, we want to know how wide a scope's field of view is at the minimum and at the maximum magnification. Both the Zeiss and the Vortex have a maximum magnification of 60x, making them easy to compare. As it turns out, they have remarkably similar fields of view at 60x. Viewed at 1000 yards, the Vortex Razor HD has a field of view of 68 feet, and the Zeiss Conquest Gavia has 69 feet. It would not be fair to compare the field of view at minimum magnification unless both scopes zoomed down to the same minimum — which they don't. As one might expect, the field of view at minimum magnification is somewhat greater (117 feet at 1000 yards) in the Vortex, whose minimum magnification is 27x. 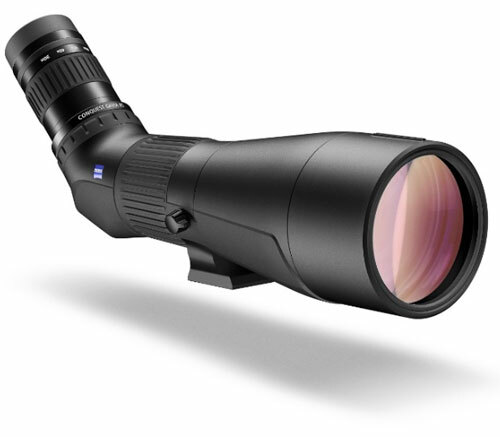 In the Zeiss, with a minimum magnification of 30x, it's 99 feet at 1000 yards. However, the subjective experience of field of view is not very different between the two scopes. 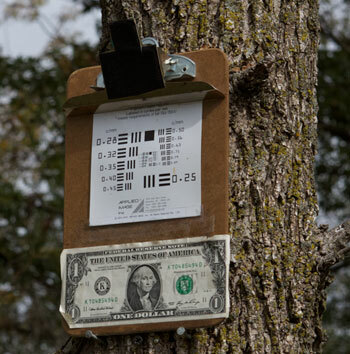 A focus band that turns smoothly makes it easier to find one's precise point of focus. The focus band on both the Vortex and the Zeiss are fairly smooth. We found the Vortex focus mechanism to be just slightly smoother than the Zeiss, but not a significant difference. This is one of the few considerations for which we found a noticeable difference between the Zeiss Conquest Gavia and the Vortex Razor HD. The minimum focus on the Razor is 16.8 feet, while the Zeiss will focus as close as 10.8 feet (manufacturers' specifications). 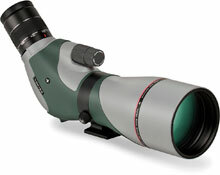 Both scopes enjoy the sleek, streamlined design afforded by the focus band around the center of the scope. Both are fully rubber-armored, waterproof and fogproof. The previous Vortex Razon was not fully armored and there were metal surfaces that could bother fingers on a cold morning in winter. The new model is an improvement. Their weights are similar, with the Vortex weighing in at 65.6 ounces and the Zeiss at 69 ounces. Carl Zeiss offers a US and Canada Limited Lifetime Warranty against defects in workmanship or materials for the life of the Product. From the Carl Zeiss website: "This Warranty... does not cover damages due to the misuse, neglect, accidental damage, mishandling or alteration of the Product." In addition, on selected products, including the Gavia, Zeiss offers a No-Fault Policy, stating. "For these products we will repair or replace product damaged during normal and intended use, without charge to you, for the first five years of ownership." Vortex Optics promises to repair or replace the Razor HD scope in the event it becomes damaged or defective, no matter whose fault it is—at no charge, with no time limit. From the Vortex website: "You see, it doesn't matter how it happened, whose fault it was, or where you purchased it." The warranty does not cover loss, theft, deliberate damage, or cosmetic damage that does not hinder the performance of the product. On warranty and price the new Vortex Razor has an advange. The Zeiss Conquest Gavia has an advantage on close focus and the name Zeiss, one of the founding fathers of the the optics industry. 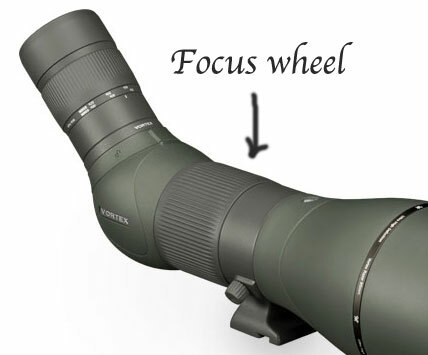 But the Vortex's wider field of view, with its minimum 27 power, can make it easier to point and find the bird. This is especially true if you use 27x to find the bird and then zoom in to 60x for a closer look. So we think these are both very good scopes and excellent values. However, if forced to choose, our pick is the Vortex as the best value of the two. Not to say that you wouldn't want to spring for the Swaro, with its incredible resolution and other features not mentioned here. But if that's not in your budget, the Vortex is an excellent buy. Click here for a summary of the scopes' specifications in chart form.